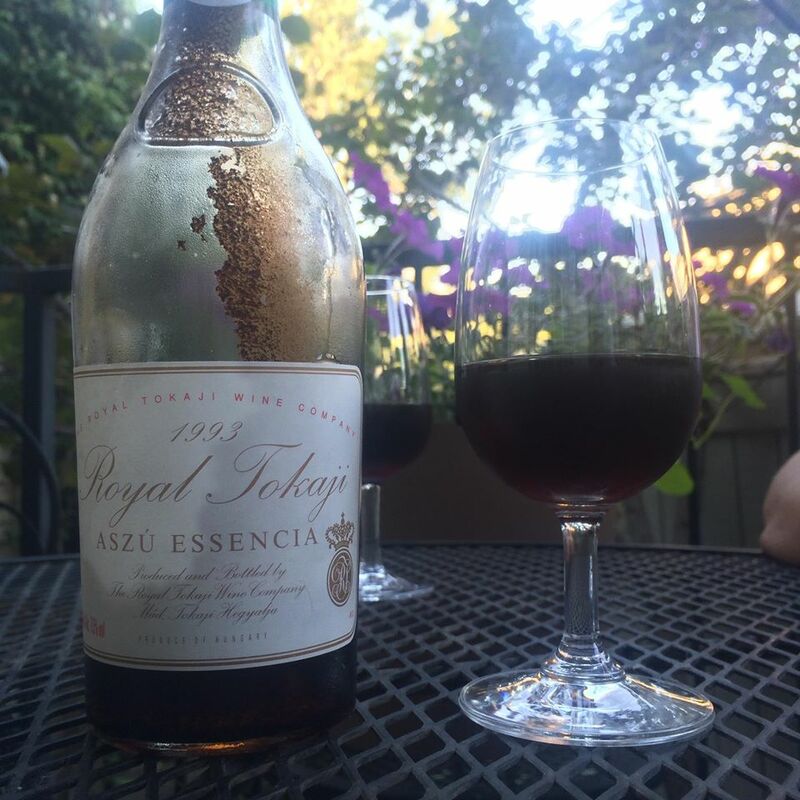 Tokaji, Aszú Essencia, Royal Tokaji Wine Company, Tokay-Hegyalja, Hungary, 1993, 500 ml, 7.5% abv. C$246-365 (where available). This is an example of the famous Hungarian fully sweet dessert wine, Tokaji (‘Toe-kai‘). I have written about Tokaji before; pop to this page for a refresher. For this version, producers blend their free run juice with the best Aszú (which is not a grape, but a type of wine made from botrytis affected white Furmint grapes). This raises the sugar levels and the quality and classification of the wine – and it creates the very special Aszú Essencia which is the bridge between the classic Aszú wines and the incredibly rare Essencia. To put this into perspective, the average sweet Auslese wines made from Riesling grapes have about 8-9 grams of sugar per litre and a sweeter Beerenauslese would have a high of 128 g/l. The Aszú Essencia boasts 350 grams of sugar per liter. Tooth rotting sweetness but never cloying because of the extremely high acidity which balances the high sugar content, this one is no exception. A bona fide collectors’ item that was stored upon purchase in 1993 in a darkened and temperature controlled wine cellar, the box wasn’t even opened for over 22 years. From an officially excellent vintage (the best so far are agreed upon as 1993, 1999, 2000), this wine is WSET Outstanding. A beautiful deep brown, the wine has viscous, thick legs and heavy sediment with deeply developed aromas of Demerera sugar, prune, fig, soft black raisins and over-ripe red apple. The palate is fully sweet and shows Christmas pudding with brown sugar, more prune, quince and marmalade with orange oil. Literally, this is gorgeous. The long finish shows off the first class acidity which balances the sweetness. Drinking beautifully now, the acidity can still support this wine for another decade. Although it could be paired with anything from foie gras to blue cheese, I would recommend enjoying it on its own just to savor as much pleasure as possible. Sumptuously rich, layered, mouth-watering and deeply developed, this is hands down, the most rare and unique wine I’ve enjoyed since I started this journey about 5 years ago. Thank you, Jane and Kevin, for sharing. This entry was posted in Furmint, Hungary, Tokaji and tagged Aszú Essencia, botrytis, Furmint, Hungary, Royal Tokaji Wine Company, sweet wine, Tokaji, Tokay-Hegyalja. Bookmark the permalink.